America's top banker is growing increasingly alarmed by the rhetoric of this election season. JPMorgan Chase (JPM) boss Jamie Dimon called the political environment "terrible," and blamed talking heads on cable news for making it even worse. "They are just jazzing you up. You're being manipulated," Dimon told CNNMoney's Poppy Harlow in an exclusive interview from Detroit. The JPMorgan CEO specifically mentioned both FOX (presumably Fox News) and MSNBC, suggesting an echo chamber exists when voters go home and watch these networks. "Once it's ideology, your feet are stuck in cement. You can't move anymore. You can barely breathe -- and then you're just angry," Dimon said. Dimon also knocked the political candidates, saying the "scapegoating" and "finger pointing" are not helpful. Instead of listening to the political rhetoric, Dimon urged voters to "learn to think for yourself" about the key issues, possible solutions and potential unintended consequences. "It's really important that policy be properly designed. It's not enough just to...get angry over a subject," Dimon said. For instance, Dimon expressed concern about how leading presidential candidates on either side of the aisle have bashed free trade. Both Donald Trump and Bernie Sanders have blamed trade deals for shipping jobs overseas and Hillary Clinton has said she doesn't support the Trans Pacific Partnership. Dimon said he gets why average Americans are upset following the Great Recession. "I understand too that there are segments that have been left behind. And they are angry," he said. Dimon has given to both Republicans and Democrats in the past and donated $50,000 to the 2009 Obama inauguration committee, according to OpenSecrets. However, he hasn't given to any of the 2016 presidential candidates. In his annual letter to shareholders, Dimon said it's important for citizens to "read and listen to great thinkers who have an alternative point of view." 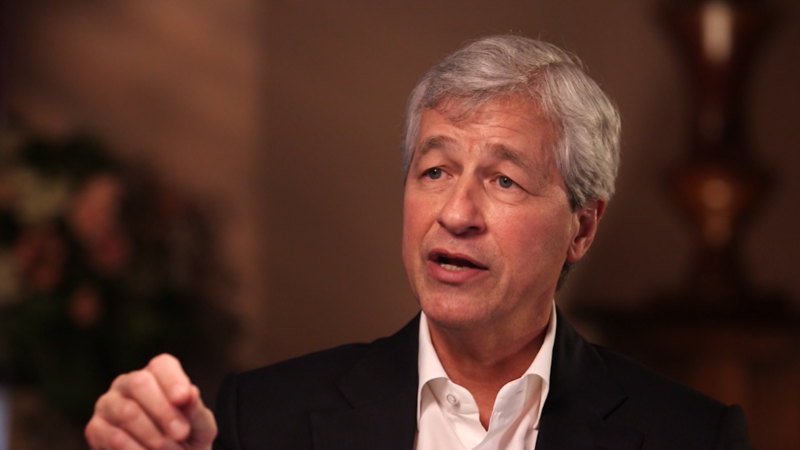 Dimon did single out at least one politician for praise in his interview with CNNMoney. He called U.S. House Speaker Paul Ryan "wonderful" and also expressed admiration for Bob Gates, who served as the secretary of defense under both Republican and Democratic presidents. And Dimon urged today's politicians to recall how Abraham Lincoln handled far more challenging situation. "Abraham Lincoln never denigrated, never scapegoated, never finger pointed. And he had reason to," Dimon said. "Those problems were worse and he held the country together and got people to work together in a wonderful way." He quoted Lincoln's famous pledge in his second inaugural address to "bind up the nation's wounds" following the Civil War. "We need a little binding this election. A little love," Dimon said.